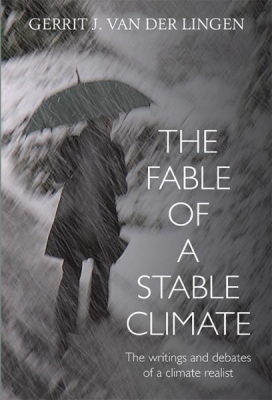 Fable Of A Stable Climate : The Writings And Debates Of A Climate Realist - ubiq bookshop: the best place to buy books! Man-made climate change has become an all-pervading global obsession. We are being told that the science has been settled and that almost all climate scientists agree with the opinions of the UN Intergovernmental Panel on Climate Change. The latter is demonstrably untrue. There are thousands of well-qualified scientists who are critical of the quasi-religious man-made climate change dogma. Unfortunately, they are by and large ignored by the world media. The author of this book, Dr Gerrit J. van der Lingen, is a geologist and paleoclimatologist. Studying climate change in the past made him realise that the belief in catastrophic man-made global warming (now called climate change) is not supported by sound science. He became involved in the debate between the belief in the dogma and the science based on observations and actual measurements, a debate between ideology and proper science. For fifteen years he wrote articles, gave lectures and took part in oral and published debates. He has now collated these activities in this book. These memoirs provide a fascinating insight in the disagreements about this global obsession.